This entry was posted in Antipsychotic, Opiate, Success Story and tagged Substance Abuse on July 25, 2014 by ATMC Team. I stand here today happy, confident, and drug free. 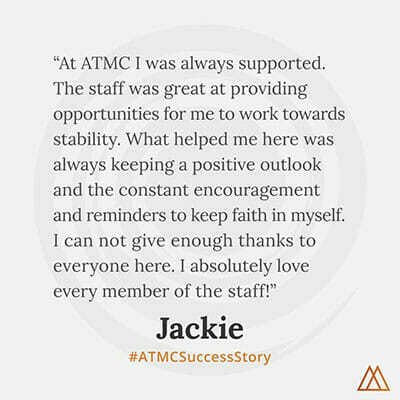 I am so grateful every day that my family and I found ATMC. Life before I came to ATMC ( in Sedona, Arizona ) was not life. It’s hard for me to honestly put that experience into words. It was a strange kind of living death. I lived for drugs and misery. I like to say now that I had an intimate and monogamous relationship with Crack Cocaine. I also had been on and off psychiatric medications for more than four years. I had no faith in myself or my future, and I truly thought that there was no way out. I had tried rehabs, therapy, medications. Nothing worked. All I knew was misery and despair. It had gotten so bad that I would cry for hours at a time because I missed my mother so badly; she lived less than ten minutes away, but I couldn’t stay clean long enough to go and see her for even twenty minutes. I could not stop, could not live, and could not die. It was at this point that my mom found ATMC for me. I had tried 4 other rehabs, and had absolutely no hope. I no longer wanted to live the life that I was living, but honestly saw no other options. To this day I don’t know exactly who it was that walked onto that plane, but I know that it couldn’t have been me. I was never that brave, nor that determined. But I know that when I got off that plane, I felt a serenity and hope that I can not explain. I was met by a staff member from ATMC, and we talked the entire way from the airport to the center. When I walked onto the beautiful property, I somehow felt like I was home. I felt this strange tingling in my heart, along with a light-headed and dizzy feeling. I realized that this odd feeling was hope. I had never felt it until now. At that point I was on Seroquel, Prozac, and Vistaril. The goal was to slowly wean me off of these medications, but I was so terrified of life off of all drugs. I was so convinced that I was broken, insane, that nothing could ever fix me. I thought that the only way to stay even slightly stable was to continue my medications. That was what all of the doctors told me, what my family thought. But these people here had faith in me. They believed that I could live free from psychiatric meds. It was an unbelievable prospect to me. As time went on at ATMC I found myself slowly beginning to believe in both who I was and who I could be. I started to believe that I wasn’t as “insane” as I had always thought before. I came to have a respect for myself. Slowly my ties with my family began to heal; I began to love who I was. I had faith again. It was not an easy path, but it was the only one that has ever worked for me. I heard a long time ago that nothing worth fighting for is ever easy. I find that so true. At ATMC I had to fight myself almost every day. I had to fight the thoughts and fears that had been stamped into my mind since I was a child. At ATMC I began to believe other things. As I write this it has been four months since I graduated from the ATMC program, which is the only program that I have ever graduated from. I have remained clean, and just recently celebrated 7 months abstinent from all illegal substances. I had success with Seroquel withdrawal, discovered that life itself is an alternative to Prozac, and have remained successful in getting off Vistaril. I stand here today happy, confident, and drug free. I am so grateful every day that my family and I found ATMC. I will never forget the people there that helped me fight for my life.